The Bridge of Slovak National Uprising (The SNP Bridge) being also called by foreigners as a U.F.O. Bridge and the Dannau river. Personally, I do consider this picture for the best one out of the serie being taken while Arty's stay in Slovakia. 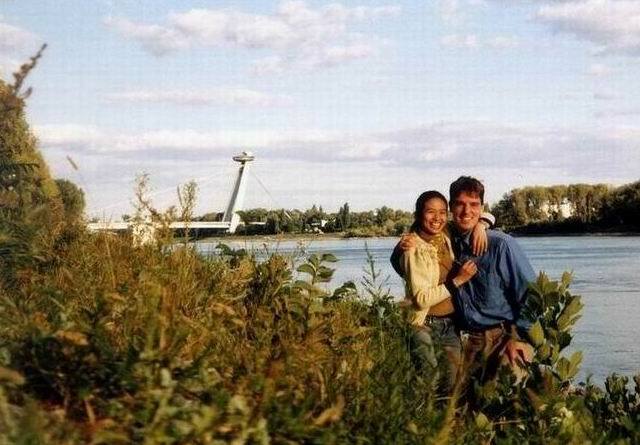 Somehow, it emits kind of positive energy with our smiles, clear skies and grass colors and interesting moment of the UFO/SNP Bridge in at the back. I like this one.